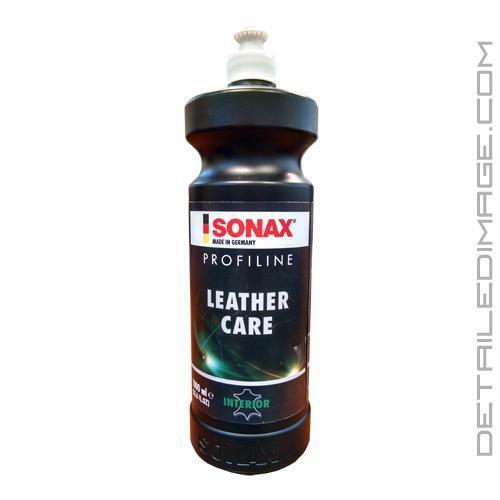 The Sonax Profiline Leather Care Cream is a premium leather conditioner that will help rejuvenate and moisturize your leather and vinyl seats. Over time, the natural proteins and lubricants that give your leather its beauty and strength, will fade and wear away. It is essential to not only clean your leather, but also moisturize and condition your leather so that it stays soft, supple, and crack free. Sonax highly recommends cleaning your leather with the Sonax Leather Cleaner Foam, but what steps should you take after that? There is a simply answer and it is the Sonax Profiline Leather Care Cream. This professional strength formula, will help restore and moisturize your leather seats with ease. The creamy formula allows the product to sit and soak into your leather, restoring the proteins and lubricants that may have been removed over time. Do not wait any longer, keep your leather looking its best with the Sonax Profiline Leather Care Cream! Wax-free leather care cream with UV protection for smooth leather. Maintains and restores the leather's original colour. Special anti-creaking additive ensures supple surfaces with a pleasant soft feel. Evaporates fast; does not grease. With a fresh, subtle scent. This is one of the best leather care creams I have used, and I have had leather in my cars for over 20 years now as it is my choice of upholstery for an automobile. I really like this gel/cream because it has a nice consistency, goes on easy and quick, has a pleasant aroma, not too strong or anything like that, and it really doesn't linger too much, but when you get in the car you can tell it is a nice clean smell. This cream absorbs into the leather, no need to wipe it off as there is no residue left, which means to me that is was absorbed into the leather. No greasy feel or shiny look.